Rachel Harris volunteered with Samaritan’s Purse in Athens, Greece, for two months. For two months, I had the privilege of working with Samaritan’s Purse in Athens. The last year has seen thousands upon thousands of refugees arrive in Greece. With closed borders, many of these refugees are stuck in Greek refugee camps, uncertain of what the future holds. Fleeing war and violence in search for safety, refugees have arrived in Greece hoping to start new lives, which can seem a hopeless task in the current circumstances. During my time in Greece, two things struck me: The need is so great, and Jesus is indefinitely greater! The need is evident, and it can be overwhelming. These feelings were present as I sat with a man visibly distressed detailing his asylum case and questioning if he will have a positive outcome. He feared the uncertainty of the future and seemed haunted by his traumatic past. While I stood in a refugee camp with a father describing the ordeal of taking his 40-day-old baby in a boat on a stormy night to flee their country, again, I felt the overwhelming nature of the crisis. The need is great, and seeing it face to face, hearing individual stories, only increases that. At the same time, however, I was constantly reminded that Jesus is indefinitely greater. I was reminded 1 John 4:4d: “He who is in you is greater than he who is in the world” (NKJV). I was reminded that God is in control and drawing His people to Him. Samaritan’s Purse is showing God’s love in such a practical way. I loved hearing stories of people who have been able to hear the Gospel, possibly for the first time. God uses every situation for good. In the midst of hopelessness, trauma, and devastation, He is there. It was a privilege to see firsthand the dedication and passion for God that the Samaritan’s Purse staff members have. The heart of God was visible through their actions, and, again, I was reminded that Jesus is greater. They are loving people deeply, caring personally, and praying often. The generosity and hospitality I was shown by refugees who freely invited us to share their little food was mind blowing. The efforts and love given by the Samaritan’s Purse staff members were also inspiring. It challenged me to freely give what I have to others—not only physical items but also the grace and love that Jesus has shown me. It was a reminder of Matthew 10:8e-f where Jesus says, “Freely you have received, freely give” (NKJV). God’s love and grace given freely motivates the Samaritan’s Purse staff members to show this same love to others. It was a huge privilege to love those that I met in refugee camps, to play and show love toward the children I met, and to take the time to listen and show care when people shared their stories with me. The needs are so great, and there is so much to be done, but let us not forget these truths of God: that we can only give and love because of who He is and that He is sovereign. 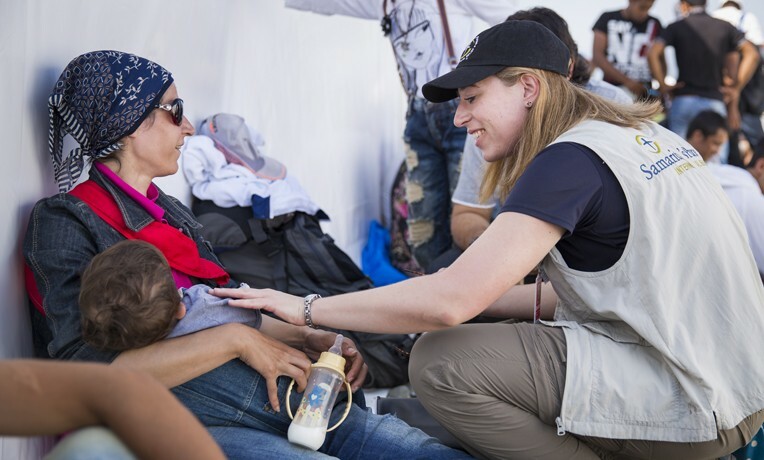 Please join me in praying that the Samaritan’s Purse staff members responding will know God’s love and goodness evidently, that God will continue to use these situations for His good and to draw people to Him, and for the refugees to understand that God is in control and greater than their circumstances.